1 of 3 Cook bacon in a large nonstick skillet over medium heat for 6 minutes, until crisp. Cool and crumble bacon; save drippings. 2 of 3 Rinse rapini; cut into 2-inch pieces. Blanch in a large pot of lightly salted boiling water for 1 minute. Remove with a slotted spoon; scoop out 1/4 cup water. Return remaining water to boiling; add pasta. Cook as per package instructions. Drain. 3 of 3 While pasta cooks, reheat bacon drippings and add garlic, olives, red pepper and mushrooms to pan. Cook 3 minutes, until garlic is softened. Add reserved water and rapini. Cook 2 minutes. 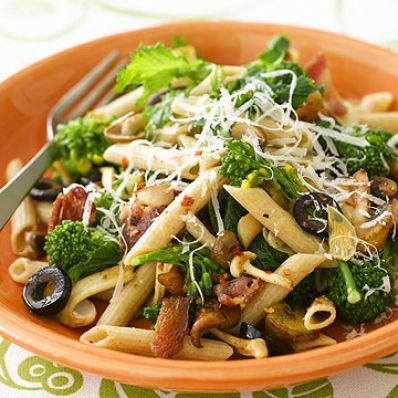 Toss with pasta, bacon, olive oil and Parmesan. Per Serving: 15 g pro., 16 g Fat, total, 62 g carb., 4 g sat. fat, 14 mg chol., 250 mg sodium, 7 g fiber, 452 kcal cal.